Ahead of the release of the government’s new Education Bill, education secretary Nicky Morgan has defended plans to turn more schools into academies, at a faster rate. Christine Blower, General Secretary of the National Union of Teachers, argues that the move will not benefit pupils. The education secretary Nicky Morgan has launched a bill designed to sweep away any obstacles when as many as 1,000 “struggling” schools convert to academies. 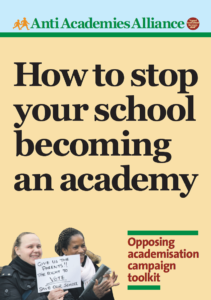 It is designed to prevent appeals and reviews, and will impose a new duty on councils and governing bodies, whatever they believe is best for their children, to actively support the change to academy status. The Tories believe they have the wind in the sails. Morgan’s announcement of a new Education Bill is pure Gove: More “failure”, more blame, more academies, and more privatisation. The announcement over the weekend that Nicky Morgan will speed up the process to make schools that are ‘coasting’ into academies, is an about face for the Education secretary. She has previously said that the academy model is not the only model that succeeds. 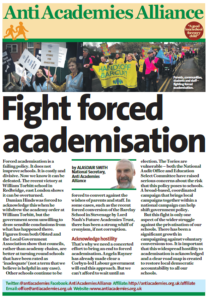 Yet now the message is: “Academies are a ‘better kind’ of school than local authority ones”. 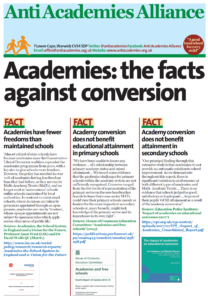 Posted in News, Top story	| Tagged Headteachers, Nicky Morgan	| Comments Off on Show us the Evidence!